Since 2003, the breakdown of the unitary state in Iraq, and the subsequent cycle of collapse and repair, has led to the proliferation of armed actors. In political studies literature, hybrid security actors are defined as armed groups that acquire a share of the state’s “authority, legitimacy, and capacity.” In post-2003 Iraq, however, the diffusion of these three factors has meant that armed groups serve simultaneously as formal and informal actors, blurring the distinction between state, non-state, and hybrid. For instance, in the fight against the Islamic State, the Popular Mobilisation Forces (al-hashd al-shaabi, or PMF), an umbrella organisation of some 50 predominantly Shia paramilitary groups and brigades, emerged vis-à-vis a weakened Iraqi state security apparatus and to play a leading role, particularly in the earlier battles (2014–2015), in defending and reclaiming territory. During this process, it acquired a share of authority, legitimacy, and capacity. Although the PMF operates outside the direct command and control of the central government, it is recognised by the state. Moreover, several PMF militias have captured control of state institutions at both the national and local levels. Following the military defeat over ISIS, Iraq is now entering into a phase of repair and state re-building. Since coming to office, Iraqi Prime Minister Haider al-Abadi has revived the state’s armed forces, which took the lead in the battle against ISIS from the spring of 2016. However, and despite calls for integration or dissolution, the PMF remains powerful, popular, and legally recognised as an independent state entity. Moreover, the stronger PMF groups plan to compete in the 2018 elections and gain further control of local and national state institutions. As such, they will feature in the next attempt to re-build the state in a post-ISIS context. These paramilitary groups simultaneously cooperate and compete against the state for power, legitimacy, and capacity. This competition is not only military, but extends to the political and socio-economic realms. Far from a monolithic organisation, the PMF represents a mix of divergent ideologies, based on political allegiances to either Iranian Supreme Leader Ali Khamenei, Grand Ayatollah Ali al-Sistani, or Iraqi Shia cleric Muqtada al-Sadr. Within the PMF, the pro-Khamanei grouping remains the strongest and represents a more long-term oriented military and political vision. A hybrid organization competes for legitimacy vis-à-vis the state. In response to the Iraqi military’s loss of Mosul in June 2014, former Prime Minister Nouri al-Maliki established the PMF Commission (hay’at al-hashd al-shaabi) to institutionalize and unite paramilitary groups that he had been relying on for the past few years of his premiership. Many of the strongest groups, which were pro-Khamenei, existed prior to the formation of the commission. These original groups included the Badr Organisation (established in 1982), Asa’ib Ahl al-Haq (2006), Kata’ib Hezbollah (2007), Kata’ib Sayyid al-Shuhada (2013), Harakat Hezbollah al-Nujaba (2013), and Kata’ib Jund al-Imam (1991). To obtain religious legitimacy, Maliki and his senior PMF allies took a fatwa (religious ruling) issued by Grand Ayatollah Ali al-Sistani, who called on volunteers (mutatawi’een) to rise up and defend Iraq. Sistani, who had wanted the volunteers to join the state security apparatus rather than paramilitary groups, was unable to stop this process. Eventually he also accepted militias loyal to him to join as part the PMF (however, Sistani would indirectly protest the PMF by never mentioning it by name, but always referring to the “volunteers”). Rather than enlist and rebuild the Iraqi security sector, at this point, the PMF leadership had created an alternative security structure. In 2014, the PMF’s ability to mobilize and defend Iraq vis-à-vis the humiliation of the Iraqi army’s collapse in Mosul raised its popularity among the population. In 2015, only 9,000 out of an expected 24,000 recruits had joined the Iraqi Ministry of Defence. However, according to a senior PMF intelligence official, 75 percent of men ages 18 to 30 residing in the Shia provinces had signed up to the PMF. By 2017, and despite a rise in the popularity of the Iraqi armed forces, 75 percent of Iraqis (outside the Kurdistan Region) believed the PMF should be included in any national dialogue. To add to the religious and popular legitimacy, in November 2016, the Iraqi parliament passed Law Number 40 (2016), which legally recognised the Commission of the Popular Mobilisation Forces. Article 1 (1) stipulates that “the PMF is an independent military formation as part of the Iraqi armed forces and linked to the Commander-in-Chief.” With this law, in the words of a senior Iraqi lawmaker, “the PMF is now, to me, the same as the Iraqi army.” However, the wording of an “independent” yet state entity allows the PMF groups to function both inside and outside the state system, blurring the line between formal and informal. The PMF also compete for capacity and resources. In October 2015, PMF administrator Abu Mehdi al-Muhandis sent a damning letter to Abadi calling for greater fund allocation to the PMF, which was on the front lines fighting against ISIS. The Prime Minister’s Office (PMO) had little choice but to accept the PMF’s demands, and since then has paid between $1 to $1.5 billion annually to the hybrid organisation. The PMO was unable to exercise the power of the purse, and instead was forced to pay PMF groups rather than individual fighters in an integrated manner, leading to a lack of accountability and transparency over finances. The senior PMF leadership, then, held complete decision-making power over spending. Despite re-building under Abadi’s premiership, the Iraqi state’s security apparatus continued to rely on the PMF for support. The victory in Mosul, for instance, came at a heavy cost to the state’s armed groups, which suffered high attrition rates, and led to a need for support. For instance, according to a Kurdish military intelligence source, Baghdad’s retaking of Kirkuk from the Kurdish Peshmerga was made easier because the state’s fledgling armed forces were operating with PMF support. In sum, although most of the paramilitary groups formed after 2014 will disband following the military defeat of ISIS, the post-2003 pluralisation of security provisions means that certain groups will maintain a share of influence, legitimacy, and capacity vis-à-vis the state’s security apparatus. This point is particularly true for the pro-Khamenei groups that existed before ISIS took over one-third of Iraq. Successes on the battlefield have raised the PMF’s political profile. The stronger pro-Khamenei groups are not only military competitors, but also full-fledged political parties. They seek to use the legitimacy acquired from the fight against ISIS to gain political standing. In anticipation of the 2018 Iraqi elections and government formation process, the PMF has for several years indicated its desire to run on a single electoral list. Complications arising from Iraqi law, which prohibits military entities from entering into political office, have served as set-backs. However, a name change and a disassociation of the armed and political wings can overcome this loophole, such as when the Badr Corps rebranded to the Badr Organisation and split the armed and political wings allowing it to pursue political office. In January 2018, a number of PMF groups, including the Badr Organisation, Asa’ib Ahl al-Haq, al-Nujaba, among others, announced the Fatah Alliance. In the words of Maliki in 2016, the “PMF leaders are already politicians.” In this sense, PMF groups are also part of the state’s political apparatus. For instance, at the national level, the Badr Organisation has held 22 members of parliament since 2014. During the same time period, Asa’ib Ahl al-Haq has had one MP. At the local or provincial level, these PMF groups similarly enjoy political representation. For instance, in Diyala, Governor Muthanna al-Tamimi is from the Badr Organisation. To gain political standing, these leaders compete against Abadi and his allies. Hadi al-Ameri, who leads the Badr Organisation and who will lead the PMF electoral list, has on several occasions in the past criticised the prime minister. For instance, he publicly condemned Abadi’s plan to side-line the PMF during the battle of Fallujah in 2016. Moreover, he used the prime minister’s failed reform package to argue that Abadi is a weak leader. Ameri, who was upset after being overlooked for the position of Interior Minister, is now looking to unseat Abadi. The political goal of the PMF electoral list is to create a new political compromise in Iraq. Many of its leaders come from the pro-Khamenei faction and as such seek to maintain strong relations with neighbouring Iran, furthermore envisioning Iraq under a strongman leadership. However, their agenda is cross-sectarian. For instance, they have employed several Sunni armed groups, which have become known as the “Sunni hashd [PMF]”, in an effort to gain popularity in western Iraq. Moreover, Maliki, who remains the “godfather” (in the words of a PMF fighter in a meeting in November 2016) of the PMF, has also made overtures to the Kurds by criticising Abadi’s approach in an effort to gain seats in the upcoming government formation process. Despite the seeming contradiction, the PMF, as a hybrid military and political organisation, as a state and non-state actor, seeks a role in the next phase of re-building the Iraqi state at both the local and national level. The vision of state capture will be pursued either as a state actor or as a non-state actor or both. The former, however, is the preference for many of the political groups. At the national level, if the PMF electoral list and its allies, such as Maliki, manage to form the next government, then the paramilitaries will be further institutionalised and directly take part in the state re-building exercise, since they can capture the state. However, if Abadi or another group manages to form the next government, then the PMF and its allies will serve as an opposition, using both its state and non-state powers to pressure the prime minister. As such, the lines between state and non-state military, political, and economic actor will continue to be blurred. At the local level, PMF groups have attempted to capture state institutions. This process not only applies to predominantly Shia provinces, but also to recently-liberated areas where PMF groups have remained and worked to imbed in local institutions. For instance, as discussed, the Badr Organisation has taken control of the provincial council of Diyala. 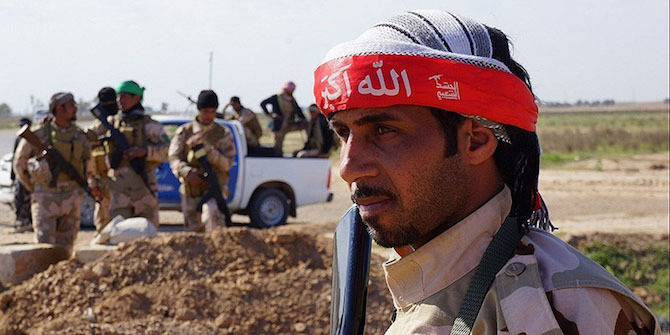 Moreover, in Ninewah, PMF groups such as al-Nujaba and Badr seek – either directly or through allies, such as the Sunni hashd – to gain control of the provincial council, local police, local state courts, and other provincial state institutions. According to two local PMF sources cited a recent report by the Rise Foundation, following the victory over the Islamic State, 60 to 70 percent of Mosul’s Federal Police are affiliated with the Badr Organisation. Moreover, according to another local trader from the city of Baiji, al-Nujaba has taken over several informal and smuggling markets in north-western Iraq. The rise of the PMF, which balances between formal and informal spaces, is a consequence of the diffusion of power, legitimacy, and capacity in the post-2003 Iraqi state. As Iraq moves towards a cycle of state repair after reclaiming most of its territory from the Islamic State, the debate over “reigning in the militias” has resurfaced. However, unlike the last period of state repair in 2008, when former Prime Minister Nouri al-Maliki fought against militias, this time, the Iraqi state has legitimised the PMF. The paramilitary groups also remain popular on the ground and have used their fight against ISIS to further their legitimacy. Moreover, several of the groups now control state institutions. Therefore, a plurality of security provision is likely to shape the next phase of state re-building. The stronger armed groups will operate along a state and non-state spectrum, depending on their success in the upcoming government formation process. However, the integration of fighters into the state security apparatus is only part of the solution and does not address the structural problem linked to the breakdown of the unitary state and the balancing act between formal and informal power.